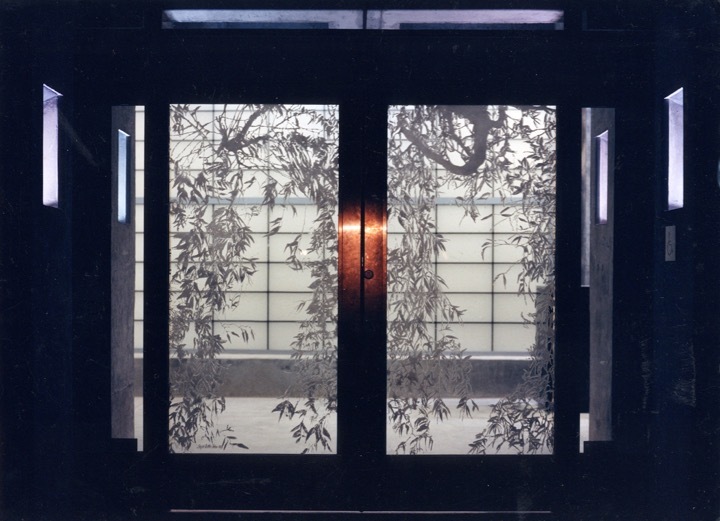 Balboa Park Activity Center, commissioned by the City of San Diego, Entry Doors, hand-etched glass, 1999. 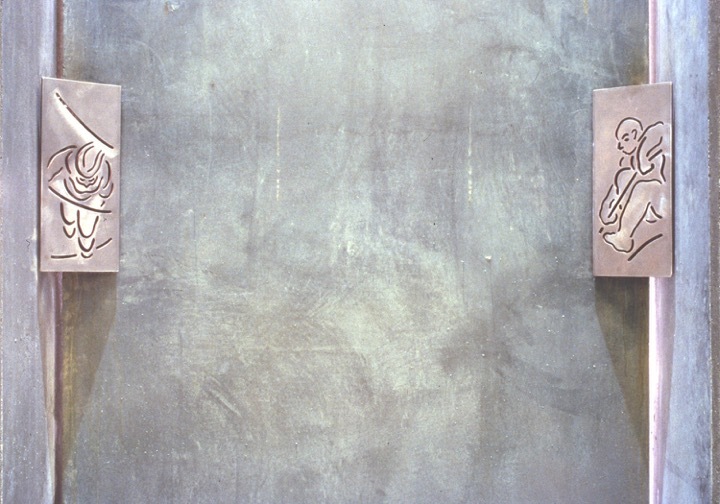 Balboa Park Activity Center, Entry doors, hand-etched glass, 1999. 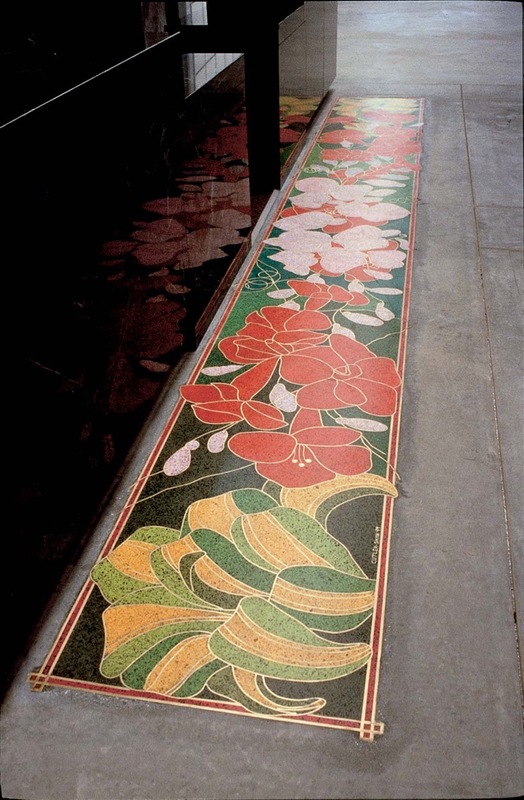 Balboa Park Activity Center, Terrazzo Floor Painting 1, Entry Installation, 1999. 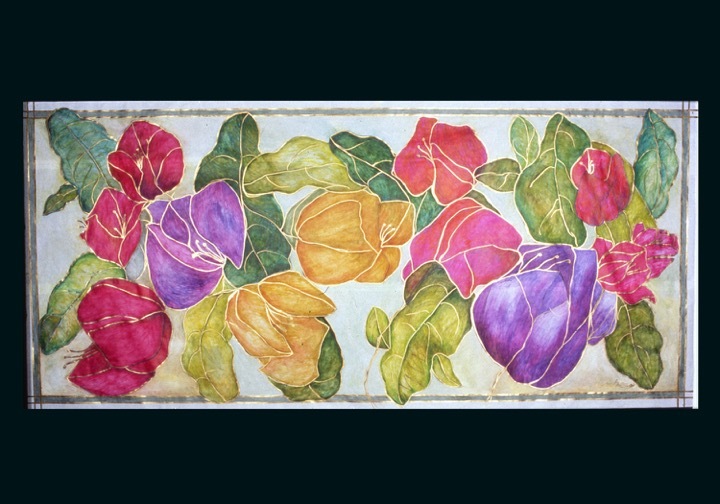 Balboa Park Activity Center, Painting for floor installation, 1999. 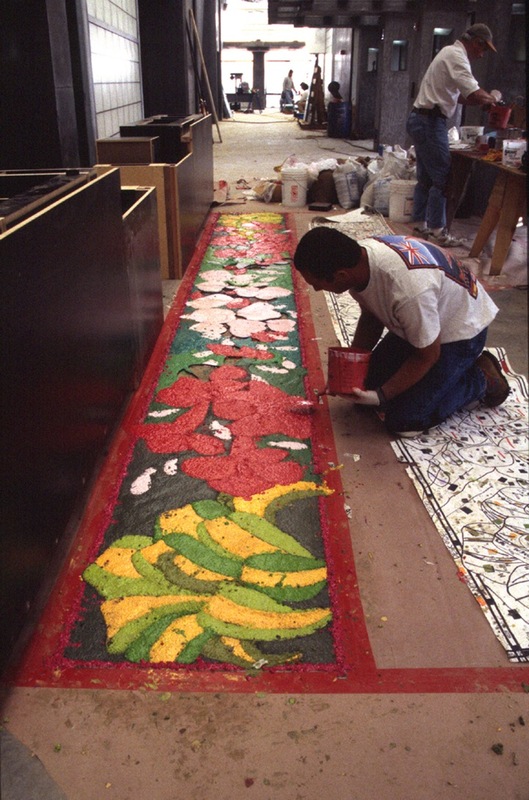 Balboa Park Activity Center, Entry floor painting in process, 1999. 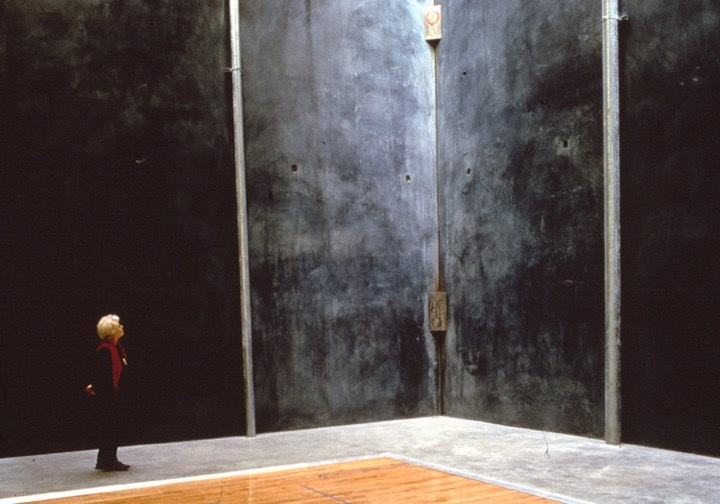 Balboa Park Activity Center, Entry floor painting, complete, 1999. 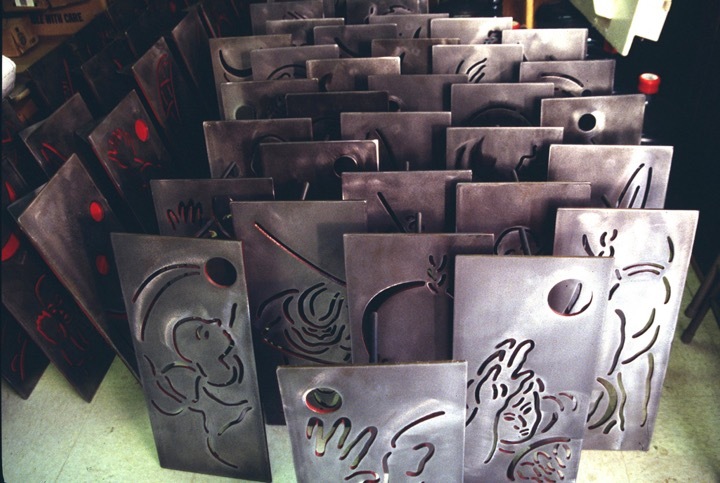 Balboa Park Activity Center, The Circle and the Self, (metal cutout plates), 1999. Balboa Park Activity Center, The Circle and the Self, images for patio, 1999. Balboa Park Activity Center, The Circle and the Self, patio installation, 1999. Balboa Park Activity Center, The Circle and the Self, patio installation detail, 1999. Balboa Park Activity Center, commissioned by the city of San Diego in 1997, was the first new building in San Diego’s notable Balboa Park in thirty years. Given its environmental and historical significance to the city, it was important that the Activity Center extend the landscape and garden aspects of the park to the new Activity Center’s Inspiration Point site within a contemporary structure. The artist’s consistent approach to public projects centers on the investigation of art and its natural and landscape environment. 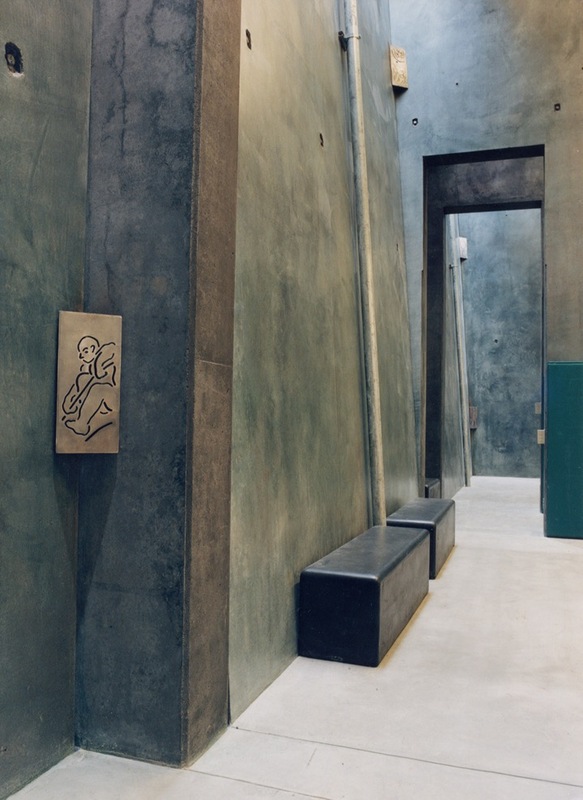 Cutler-Shaw was one of two artists, with Raul Guerrero, invited to be part of the building’s Design Team of Rob Quigley AIA and Richard Blackman AIA architects. She created five installation works for the building. 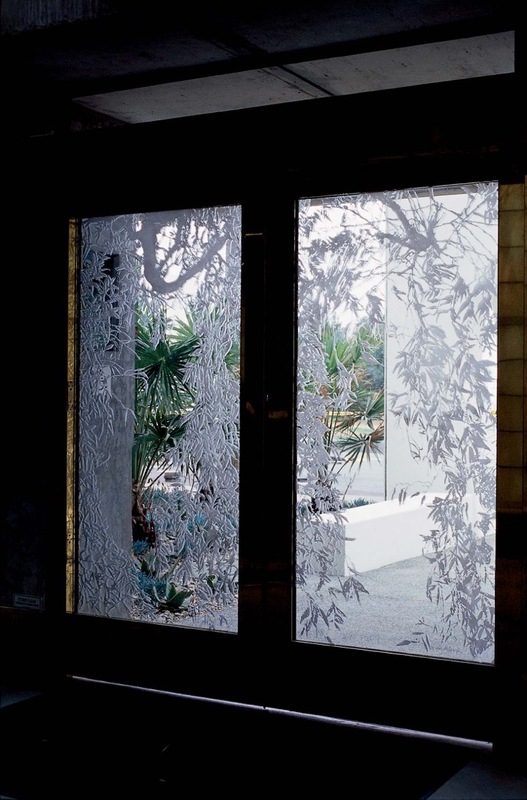 The "Etched Glass Entry Doors" depict the leaves and branches of the eucalyptus tress, so identified with the park and San Diego’s landscape. She created the work by having duplicate panels of parallel matching patterns with the designs on the inside, hand-inking one for a shadow pattern. Both exterior sides were clear to facilitate cleaning without damaging the etched design. Because they are automatic sliding doors, in their movement, they reinforce the effect of leaves in motion in nature. 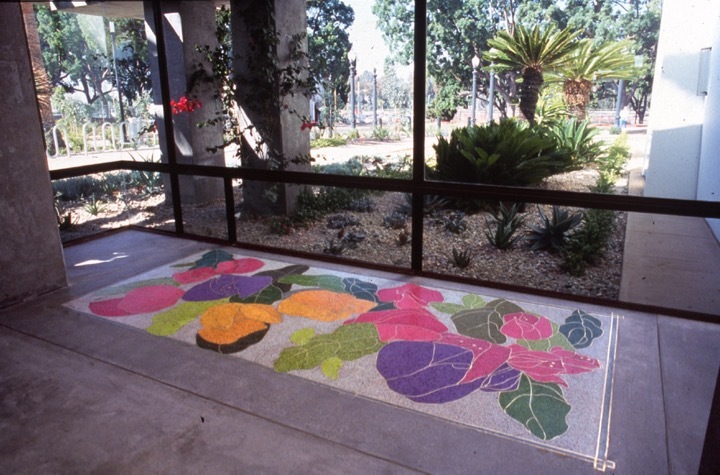 Two of her terrazzo “floor paintings” are in the entry lobby (one 3 feet by 20 feet; the other 5 feet by 11 feet) using seventy-two color combinations taken from her color drawings of enlarged images of native vines, flowers, and tropical plantings of the Activity Center, such as bougainvillea, aloe, and wisteria. "The Circle and the Self" is a visual narrative for the outdoor plaza, consisting in twenty-six terrazzo inserts, each 16 x 16 inches square. Circling the gymnasium interior, the narrative reads in seventy-two laser-cut metal plates, each 22 inches high by 10 inches wide. It is a picture story that honors the human body as tested in sport and play, within environments near and far—from the city and nation to earth and the galaxy. A circle is the connecting image of the story. 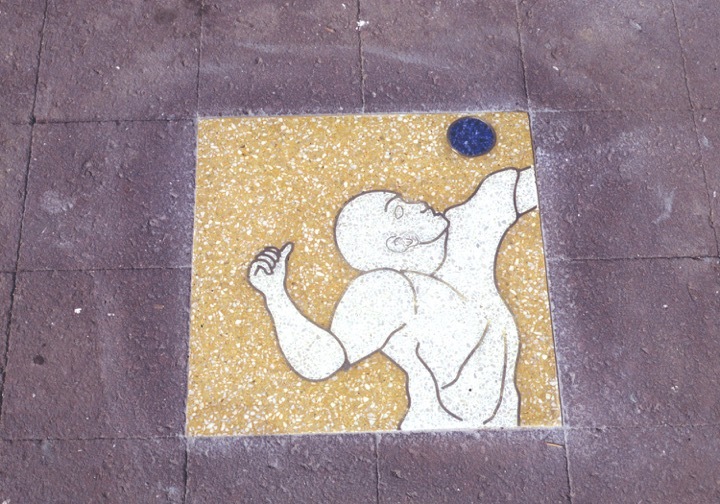 The pictures are drawn in metal lines in square terrazzo tiles that are set in a circle within the plaza’s tile pattern of the map of the western United States, designed by fellow artist Raul Guerrero. 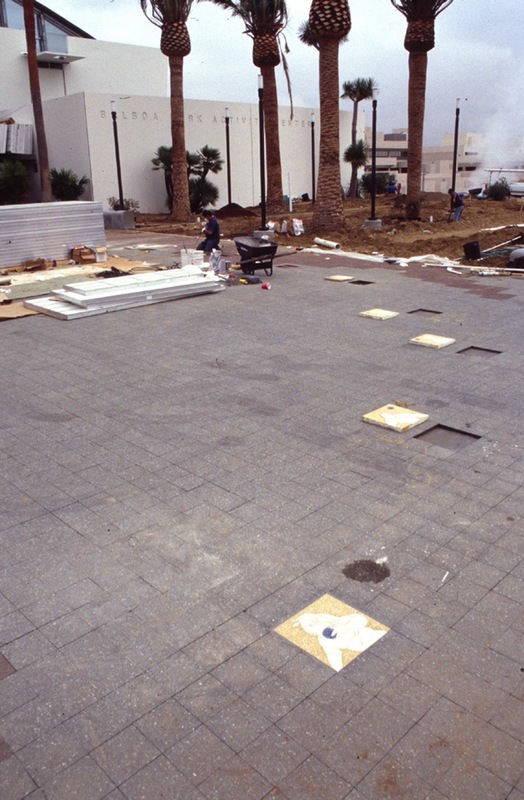 The map is outlined in the asphalt pavers of the outdoor plaza at the south entrance of the Activity Center in Balboa Park, San Diego. 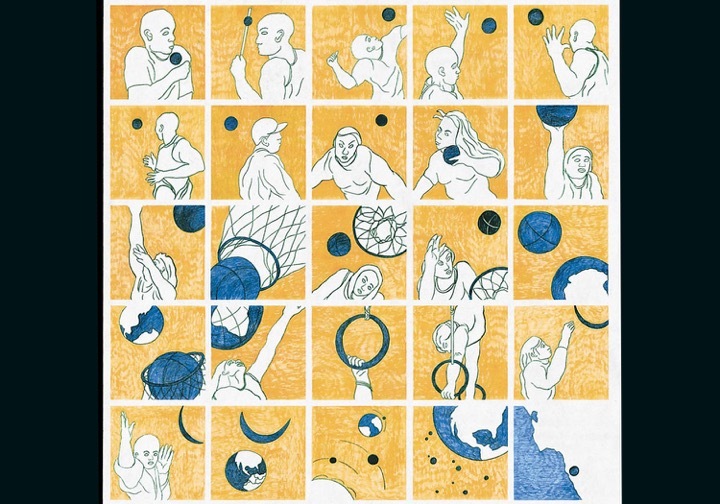 The circle transforms from a symbol of war, as a round shield or cannonball, to a sign for competitive sport, as a basketball, baseball, and those of jai alai, table tennis, soccer, or golf. In the magical language of symbols, and in this picture story of The Circle and the Self, the ring of the gymnast can become a new moon, as a sign for hope and dreams.